Camping Ribamar es un camping en Alcossebre, Castellón, situado junto al mar. El camping tiene plazas con cercos, con sombra y parcelas con algo de sombra. Camping Ribamar se encuentra junto a una playa de arena y una playa de piedras. Cabe alquilar bungalós. El camping dispone de parque de recreo y de terreno de deportes. Para los excursionistas, el camping ofrece varias rutas para bicicleta. Hay un programa de animación. El camping dispone de una piscina descubierta y una piscina infantil. En los alrededores, podrá nadar en el mar. En el Camping Ribamar se autoriza el buceo y windsurf. No tendrá que cocinar todos los días, porque en el camping hay snackbar, pizzería, restaurante (pequeña carta) y restaurante (con una amplia oferta). En el camping podrá adquirir pan fresco. Es posible utilizar el internet, pues el camping dispone de uno o de varios ordenadores con conexión a internet y en el 80% del camping se puede navegar por internet con el ordenator portátil. Este inspector visita cada año al Camping Ribamar y lo inspecciona considerando más de 200 servicios y otros aspectos importantes. El inspector es un trabajador de ACSI y no trabaja para el camping. This is an excellent site, very well maintained and in beautiful surroundings. It is a a good 2 miles into Alcossebre so bikes are useful. There are a number of mountain bike trails and walking routes through the nature reserve straight from the site. It is a short walk down a forest track to the shoreline and a number of little coves, some sandy to go swimming. Ribamar is a lovely site, well managed, maintained & laid out. The pitches are quite large, private & easily accessed. We didn\'t eat at the restaurant, but the food looked good and the drinks were reasonable. When I booked the site I was aware of the 1.5km rough access road, which isn\'t a problem if you take it steady, but we did get tired of having to use the track every time you wanted to go anywhere. We had hoped that the coastal footpath was more suitable for cycling and was connected to the promenade into Alcossebre. It\'s also a shame that the site has not got a small supermarket stocking essential items to save a trip to the supermarket in town. Alcossebre has a fabulous sandy beach and there are a number of restaurants around the harbour to choose from. This site is a revelation, stunning location, beautifully set out, impeccably maintained. The staff are helpful and friendly. Five star accommodation at reasonable price. Love it. Well worth the trip along the dirt road. Large gravelled pitches with hedges between, some with view of sea. Plenty of clean warm loos and showers. Peaceful. Lovely surroundings with coast and mountain walking. Alcossebre 29 minutes walk away (but very quiet in January). A lovely site with good facilities and very helpful friendly staff. The natural surroundings are lovely and we had some great walks and swam in the Med in November. Pitches are a good size with hedges for privacy. Highly recommended. A first class, we'll run and maintained site with large pitches. Although 4 km from nearest supermarket the site offers twice weekly morning transport. Bread available on site. Coastal situation with great walks both along coast and in hills behind campsite. Dog friendly. Would certainly recommend and will return if back in the area. We first visited this site two years ago and found it to be one of the best in Spain. It was nice to see the high standards maintained and the facilities still superb. However its not all about facilities as we found all of the staff to be the main attraction of this site. On arrival after setting the motorhome up our dog went into a convulsion, reception staff responded immediately and took us the 3 miles to the vets. They stayed with us when he was being treated and after leaving him at the vets they returned us to the site. They were very supportive for the two weeks that he was ill and regularly asked about him. Nothing was too much trouble for all staff. We spent the easter holidays here and although the site got full it remained quiet. Domingo, the site manager is always about ensuring that the site is organised and campers are looked after. Only negative is that the internet is no longer free. However the 7 nights for the price of 6 offset this charge. Great site. The camping is located in a very nice place, close to the Irta Natural Park. Close to the beach, the camping is excellent for hiking and cycling in the nearby. We visit the camping 2-3 times per year (mainly weekends). However, we have noticed a change in the way the staff treat customers. In the last two visits the director turned up unexpectedly at the pitch on Sunday and the force you to abandon the camping site before 12:00AM or instead, you must pay an extra fee of 10 euro to stay until afternoon. We have complained the staff but they say that these are the rules. We disagree with them because the camping should avoid people to stay until late afternoon in low season without paying an extra fee. Last years they didn't do this but the policy has changed (in spite of the current financial crisis). I have several concerns about foreign customers are forced to pay this unexpected fee. At arrival, the staff didn't warn about it. Nevertheless, it is a good camping but not the best. ¿Desea reservar u obtener más información sobre su camping Camping Ribamar? Puede hacerlo mediante los datos siguientes o a través de la web del camping. A7, sal. 44. Por la N340 hacia Alcoceber en el km 1018 por Las Fuentes. Siga las señales del camping. El último km es por un camino sin asfaltar. 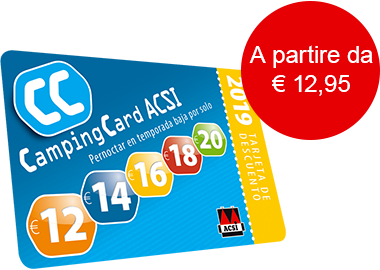 ACSI Eurocampings reenvía su solicitud de información al "Camping Ribamar".